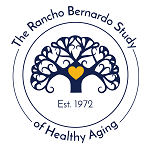 The Rancho Bernardo Study (RBS) of Healthy Aging is a community-based study, now in its 45th year. The RBS was established between 1972 and 1974 when 82% of adult residents (aged 30-79 years) of Rancho Bernardo, a suburb of San Diego, California were enrolled. Because Rancho Bernardo was marketed as a retirement community, participants had moved from all parts of the US, and half were age 60 and older. Most were married, of Northern European ancestry, and middle to upper middle class. Since then, follow-up examinations have been conducted at approximate 4-year intervals. More than 400 studies based on the RBS cohort have been published to date, many with doctoral and post-doctoral students as first author. The RBS is one of the longest, continuously funded, NIH observational cohorts in existence. It has focused on cardiovascular disease since its inception in 1972, on cognitive function since 1988 and on bone disease since 1990. The rich RBS dataset is unique in the detailed and repeated measurement of risk factors and outcomes related to these diseases, and the long period of follow-up for clinical events. Annual follow-up for vital status is conducted by mail or phone, with death certificates obtained for decedents and cause of death classified by a certified nosologist. Every other year participants are mailed a checklist of chronic diseases and surgeries, modifiable lifestyle factors (diet, cigarette smoking, alcohol intake, and physical activity), and health-related quality of life. Since 1984, RBS participants have returned for 8 research clinic visits designed to measure subclinical and clinical cardiovascular disease, cognitive function and bone health, among other outcomes. Participants from the original cohort were eligible for these visits if they were at least 45 years of age, were ambulatory, community-dwelling and able to provide informed consent. Each visit included a detailed medical history; measurements of blood pressure, lipids, glucose and physical function; administration of a battery of cognitive function tests; and evaluation of body composition and bone mineral density by dual-energy absorptiometry (DXA).